Alan Chadwick (1909-1980), the English master horticulturalist, who brought what he termed "The Biodynamic-French Intensive" approach to artistic horticulture and gardening to America, and who was tutored as a youth by Dr. Rudolf Steiner, helped initiate the entire organic growing movement in America. 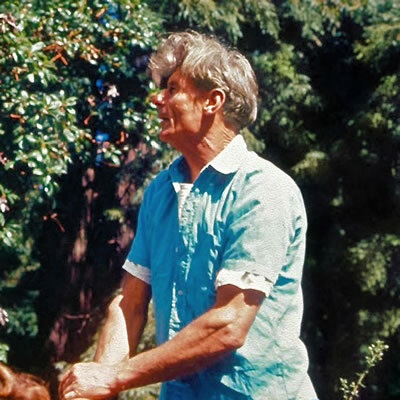 From 1967 until his death in 1980, he taught publicly and left a huge legacy, creating five gardens in the United States and inspiring hundreds of apprentices. A living library and an archive are now freely available to the public. There are videos, many hours of audio files of Alan's lectures to apprentices and public addresses, photos, written materials and much more. This archive project began in 1980, primarily by the Chadwick Society in California. The society then, via Ms. Virginia Baker, entrusted all of their archival materials to Craig Alan Siska—a former Chadwick garden apprentice—now of Verdant Vale Gardens, LLC, in North Carolina, which launched this new website. This honors Alan's final request that his work, vision and legacy be shared freely with the public. Over time, more materials will be uploaded to the website. If you have archival materials to share, please contact them via the "Contact Page" at chadwickarchive.org.